Yes; it's a constraint of the library used to display the folder structure. IIRC, it was fixed in 8.1, although it may have been 7.6. 7.1 needs an extra extension to support it at all, and 7.5.x limits the folder contents number to 500. This can be changed via some resource hackery, but you'll also need to increase the heap size for 7.5 to compensate. Is the folder limit a HS or Mojave related issue? I don´t see any limitations with my 780 or something files in "Unix" from 7.5.3 to 8.6. The file extfs_macosx.cpp (implementation of external file system) is same as latest cebix/macemu code. Therefore the behavior of the Unix folder must be same as SheepShaver2.4. I can do nothing because the problem is not reproduced. If the issue cannot be reproduced by others, it may be specific for something in that user's setup. Is the issue solved by using again an earlier version of the WPMacApp application? Still, there is a wide range of SheepShaver "2.4" builds over many years while there were changes in the source between those builds. Which SheepShaver build was used in the WPMacApp application that does not have the issue? And could there have been changes in the extfs_macosx.cpp file between then and now? Thanks for the replies. Probably something special in my project is causing this, and I'll look into whether I can reproduce it. Until I started using kanjitalk755's code this month, I was using a custom build that I made of the cabin/macemu code that I built in a 10.6 machine a few years ago. I'll experiment and report back if I find anything interesting. The problem I reported (SheepShaver not showing all files in the Unix folder) seems to have been a glitch in the user's system, not a problem with SheepShaver. Possibly he has a corrupt file that prevented SheepShaver from seeing files below it in the directory listing. Apologies for wasting bandwidth on this. So glad to find a very recent tale of success here! Would greatly appreciate some advice on running SheepShaver successfully! If it's quitting immediately on launch, it's most often due to the program not finding a compatible ROM file. For your setup, you'll want to use the newworld86 ROM, but make sure the file you rename to "Mac OS ROM" is the ROM file itself, not the .zip container. It sounds like you did extract the ROM, but from the .zip names you posted, I wasn't sure. Also, double check that there isn't a hidden extension on the filename. Go to File -> Get Info and look under Name & Extension, and delete the extension (probably .rom) if one is there. 1. See the advice above by "Elyus"
Did you try moving SheepShaver.app to your desktop, run once and put it back after success? This is a known obstacle in Sierra and up, triggered by an Apple security improvement. For the ROM, I´m always using OldWorld, as I want to run 7.6. Rebooting a different volume from inside SheepShaver does work for me that way. To set the ROM path correctly, just drag the unzipped file to the empty ROM file field. As your settings are done, close the editor and run SheepShaver. Ah, just saw Ronald was too fast for me. You are so kind to have alerted me to that issue in High Sierra! but I get this: "Can not locate the installer CD". But the installer CD is EXACTLY what I am using to install the program...! I suppose you use a disk image that is created from the CD as macOS 10.13 prevents using physical CDs in SheepShaver. - Use the latest SheepShaver 2.5 test build, not one of the SheepShaver 2.4 builds. - Use the built-in preferences editor, not the separate SheepShaverPrefs that 24bit mentioned in this thread! - Make sure the image is added to the volumes list in SheepShaver Preferences and that the CD checkbox after the CD volume is checked. Save the change. 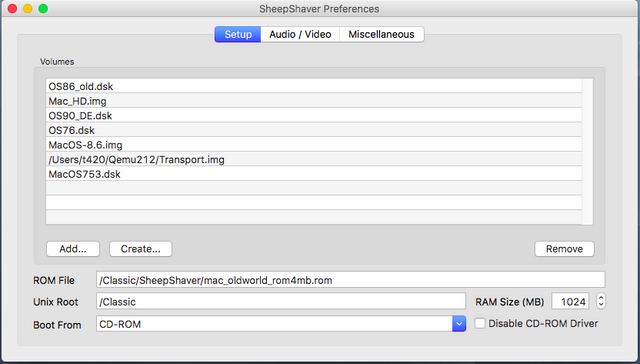 - As always: After saving any changes in SheepShaver Preferences, quit SheepShaver and launch it again. Note that the OS9 volume from Redundant Robot is not large enough for any significant additional installation. It also contains the System Folder only, not a full MacOS 9 installation. Best find a generic MacOS installation disk and do a full OS installation as described in the setup manual. You can search the Macintosh Garden site for MacOS installation disks. - Allow the new volume to be initialised. In the dialog, choose an appropriate name for the volume and Mac OS Extended for the format.